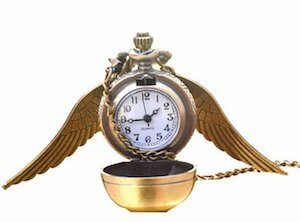 Harry Potter fans that need to know time should get this Golden Snitch watch necklace. The necklace has pendant that is a ball like wings just like the real Golden Snitch from the Harry Potter movie and then when you press the button the ball opens and there is the watch. It all has a steampunk look and is just an amazing looking piece of jewelry for the true fans of Harry Potter. 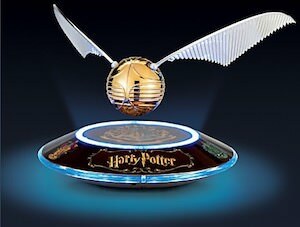 Now you know what time it is when ever you want because you are wearing the Golden Snitch that tells time. A special Harry Potter piece like this makes for an amazing present for a special someone in your life or just for yourself. 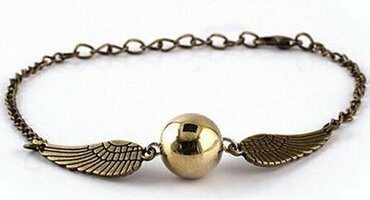 If you are a Harry Potter fan in need of a cool piece of jewelry then you should check out this Golden Snitch bracelet. The metal bracelet has a Golden Snitch as part of it and as it is a bracelet that also means that it can’t fly away so you don’t actually have to play Quidditch. Now any true Harry Potter fan can have the Snitch with them all day long as it is a great piece of jewelry that will be great on your arm and other fans of Harry Potter will now know that you are one of them.